Amid the ongoing price wars between domestic competitors and the new market entrants from overseas, Japanese manufacturers continue to struggle to keep up the pace of their businesses. The economic recovery remains slow, and these manufacturers have nearly reached the limits of possible cost reductions in their production lines. In addition, requirements for corporate social responsibility (CSR) rise year after year, and environmental concerns have become a critical management issue for manufacturers. The concerns about the quality decrease because of cost reduction reaching the limit. D Inc. manufactures electronic devices including PCs, communication equipment, and displays. The company was forced to practice patient management and sales remained sluggish. The D Inc. management instructed all departments to implement cost reductions across all production lines. Although every department reviewed and improved their operational flows in every phase, from purchase of raw materials to delivery, the company’s situation remained stagnant. After six months, D Inc. had nearly reached the limits of possible cost reductions, the company was no longer able to further reduce costs due to concerns about deteriorating product quality. 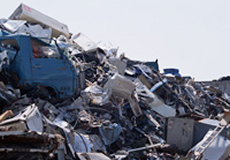 Under such circumstances, D Inc. suddenly reliazed the cost of handling the scrap generated at their production site and the waste products at the end of their product life cycle. Mr. K, the section manager of D Inc.’s R&D Department noted that the company actually spent considerable money to dispose industrial waste, improving in that area would bring a significant advantage. However, D Inc. had been using the same company to dispose the waste for years, concerns about changing the waste disposal company as well as environmental concerns were taken into account, doubts emerged as to whether changing the company would indeed be more effective than continuing to use the same company. It was at this time D Inc. received an e-mail from Tanaka Precious Metals Group regarding "effective utilization of industrial waste." Mr. K was intrigued that waste products which potentially contain precious metals can be recycled. He contacted Tanaka immediately. A person in charge from Tanaka Precious Metals Group noted that recycling generates profits in some cases. Tanaka proposed a solution for recycling the precious metals, called funds flow, in which precious metals are recovered from urban mines made up of the scrap generated at the production site as well as the waste products that have reached the end of their product life cycles, which are then recycled to restore their values. Mr. K immediately requested Tanaka to visit D Inc.’s production site. Several days later, the person in charge from Tanaka Precious Metals Group visited the site and began conducting sample analyses of the waste products which had the possibility of containing precious metals. He checked not only the scrap generated from production but also areas both inside and around the equipment. He explained that additional precious metal may be found by temporarily removing equipment from the system and performing precision cleaning. He analyzed even the dust in the cleaner used for manufacturing equipment as well as the waste cloth and surprisingly recovered precious metals even from them. This project on waste products, which started with the aim of reducing costs, turned out to be profitable. The management at D Inc. was extremely satisfied with the results of this project, which greatly contributed to their operations.